The Standard ECOM cable is a USB2.0 high-speed device that allows Controller Area Network (CAN) traffic to be transmitted and received using a computer or laptop. It was originally designed by EControls to provide a CAN interface for OEM customers to communicate with our ECUs. Now we are offering it to anyone for custom software development. 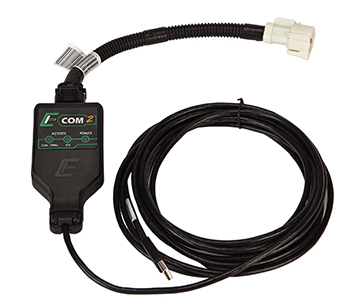 The ECOM has been in use by EControls and our OEM customers since 2006 and is designed using the same quality components that go into our ECUs. The Standard ECOM device will not work with the CANCapture software. It is used for custom application development using the ECOM DLL and API Library. The standard ECOM is only for use with custom user-developed software and will not work with CANCapture. The unlocked ECOM will work with both custom user-developed software and CANCapture. Easy-to-use API supports most programming languages - C, C++, Visual Basic, VBA for Excel, C#, J#, .NET, Java and any other language that can load a DLL file. Includes examples of capturing CAN data directly from Microsoft Excel, C/C++, Java, LabView and C# .NET. 29-bit, 11-bit, Error frames, remote transmission and hardware based self-reception all supported. Hardware timestamps with 64us resolution. Circuit board is protected by an environmentally resistant conformal Hi coating to keep it resilient to weather and other extreme environments. Completely powered by the USB bus on your laptop or PC (<125mA @ 5V). CAN port is electrically isolated for robust and reliable connection. Includes a sealed 15-foot USB cable to make it easy to connect to distant engine compartments or test cells. The power LED turns red when first plugged into a PC, and then changes to green once the Windows drivers have been fully installed and loaded. This takes all the uncertainty out of the windows installation and makes diagnosing connection problems very straight forward. CAN activity LED flashes green on successful reception of CAN messages and red after any CAN bus errors. The USB LED provides the same functionality for USB communications. ECOM Device Driver V3.5.0.0 - Installer for ECOM device driver, includes Microsoft Excel examples as well as the developer API include and library files. ECOM Installation Manual - ECOM hardware device driver installation manual. ECOM Engineering Approved Drawing - Official drawing that contains dimensions and pinouts for the ECOM device and connectors that ship with the ECOM. Simple C/C++ Example - ECOM library example of how to open an ECOM device and print CAN messages to the screen for 10 seconds. Simple Java Example - Equivalent of the C/C++ example but using Java instead. Also includes a useful interface class for making ECOM DLL function calls using the JNA (Java Native Access) library. Simple LabView Example (and LabView Driver) - Equivalent of the C/C++ and Java examples above, except for LabView. Simply displays all received CAN messages for X number of seconds into an array on the screen. Also contains a LabView "driver" that is a strongly recommended starting point for developing LabView applications that will use the ECOM device. C# Example and Library - Download includes a library interface class for accessing all the functions and constants used by the ECOM API/DLL library. Example simply uses this class to display all received CAN messages for 10 seconds and outputs the received messages to a console window. Library should be used for anyone wishing to do C# development using the ECOM API/DLL. Reference Harness Schematics - Basic schematic showing the pinout and color codes for the harness that comes with the ECOM device. Developer's Reference Guide - Documentation for the DLL/API programmer's interface for the ECOM hardware device. Developers who wish to incorporate the ECOM into their own software for sending and receiving CAN packets should start here.